Share the post "Download Official U.S. Military Specification Standards (MIL-STD)"
Share the post "Weaver vs. Picatinny Scope Rails"
Bench-Source, founded by David Dorris, President of Vertex Mfg. Corp., and benchrest shooter Darrell Jones, is now producing precision scope-mounting bases for the Savage round-top Target Action. CNC-machined to exact tolerances from 7075-T6 aircraft aluminum, these bases are extremely light (under two ounces) yet strong. Both Picatinny-style bases and Davidson dovetail bases are offered with either zero taper (flat) or with +20 MOA of built-in elevation. 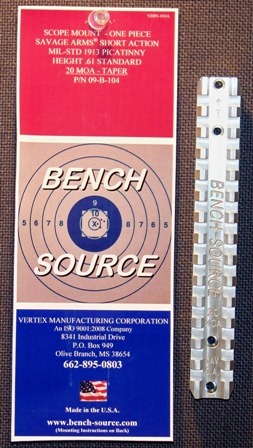 Bench-Source rails also feature precision-cut reliefs to match the loading ports on the Savage Target Actions. The Picatinny (Weaver) base costs $84.95 (either flat or +20 MOA) while the Davidson dovetail base is just $69.95 (either flat or +20 MOA). This is a good price considering the quality of the materials and machining. (The 7075-T6 aircraft grade aluminum is three times as expensive as the aluminum alloy used by some other rail-makers.) Either style base is available with either a “luster” or polished finish. The price includes a Torx wrench and mounting screws. The Picatinny M1913-A Mounting Rail features 14 symmetrically spaced cross-slots. The base is long enough to mount any popular scope. The Picatinny base is approximately .610″ tall. Parallelism deviates less than .002″ between the dovetail clamping area and top of the receiver after mounting. The screws used are #6-48 x 3/8″ long and holes are drilled and counter-bored to the correct depths. This ensures that users will not damage their barrel threads or encounter interference with the locking lugs when closing the bolt. The Davidson 1/2″ x 60º Mounting Rail dovetail is parallel over its entire length. The rail is held to very tight tolerances to minimize windage correction (at different ring positions). The Davidson rail should self-center on your action when installed per the included instructions. Both ends of the mount are chamfered slightly on a 30° angle to let the sharp corners of the mating rings align themselves without binding. The 60º dovetails are machined +/- .001″ and measured over two optimum-diameter pins to minimize over-clamping of your rings. For more information, visit Bench-Source.com or phone: (662) 895-0803. Share the post "Precision Scope Rails for Savage Actions from Bench-Source"
Pierce Engineering has just introduced its new Tactical Multi-flat action. This handsome design, crafted from chrome-moly steel, features a built-in 20-MOA rail and an integral recoil lug. The action was designed from the get-go to fit the Accuracy International chassis with no modification. With a 1/2″ flat on the bottom and 45° angled sides, the new Pierce Multi-flat short action drops right into the AI stock. Just bolt it in and shoot. The actions will cost $1295.00 and John Pierce is taking orders right now for delivery in two months. John Pierce reports: “Our new Tactical Multi-flat action features a low-profile, 20-minute integral Picatinny rail and integral recoil lug. We made the action to drop into the Accuracy International modular stock utilizing AI’s magazines as well. Though this is a short action for .308 Win and similar-sized cartridges, the loading port is much longer than usual for better access and ejection. The current price is $1295.00, and that price includes a 30° coned bolt and/or spiral fluting if the customer desires those options.” John noted that the coned bolt option works well in Tac Comps: “I have a coned bolt on my own tactical rifle that I used at ASC. I found it picks up the rounds more smoothly from the magazine. At ASC, quite a few guys had feeding issues, but my action ran perfectly. The coned bolt works slick.” Actions will come finished with NIC CeraKote in customer’s choice of colors including: Matte Black, Titanium, OD, Sand, Brown, Gray, and Forest Green. (CLICK HERE for CeraKote color options). Currently the new action will be available only in a short-action design. OAL is 8.050″, about the same as a Rem 700 short action if you include the thickness of the Rem’s recoil lug. The new actions will be made to order with a two-month lead time. After placing your order, you should get your new multi-flat action within about eight (8) weeks. Later this year, Pierce plans to release a larger Tactical Multi-flat action. This long action will work for cartridges such as the .30-06, .300 Win Mag, and 7mm Magnums. For more information, or to place an order, call Pierce Engineering at (517) 321-5051, or visit www.PierceEngineeringltd.com. Share the post "New Tactical Multi-Flat Action from Pierce Engineering"